The main stage, known as the Bowl of Brooklands. There have been a number of different things happening in our lives lately, so gardening has taken something of a back seat. Instead, I thought I would showcase the area of our local gardens that we know as “The Bowl” and Brooklands Park. For those who have been to New Plymouth, these are the upper reaches of Pukekura Park, a wonderful legacy from a much earlier generation, close to the centre of the city. This was WOMAD weekend – the world music festival which travels the globe. It is a huge event for our small city and I wanted to share the beauty of the location which accommodates 3 large stages and 3 small stages, plus all the other accoutrements of festivals. The entrances alone set the scene. That is Mark in the coral pink tee shirt, standing by George’s tree. I wrote a short tribute to George Fuller when he died. A former curator of the park for many years, he set up camp beneath that puriri tree to protest plans to remove it in order to widen the road access. In this, he was successful, as can be seen. George may be dead but his tree lives on. The entire WOMAD festival takes place within the embrace of trees. I particularly like the small Dell Stage for its intimacy and charm. Adjacent to The Dell is this lily pond. It is a good exercise in knowing your water lilies. Some lilies S P R E A D to take up all the water, which rather defeats the reflective qualities. If you plan on growing a few water lilies at home, my advice is not to plant these overly strong triffids but to seek out smaller growing, named varieties which may be less inclined to stage a takeover bid. There are easier maintenance tasks than thinning water lilies. From memory, the white sculpture is based on cloud formations and was placed to be reflected in the water. To me, I fear, they are more evocative of toothy molars but each to their own. We were at WOMAD this time because I was involved. Nothing musical – I do not have a musical bone in my body, although Mark is an ageing rock and pop drummer from way back. He still has his drum kit, though I banished it to the shed rather than a spare bedroom. I was interviewing winemaker Allan Scott, a leading light in the Marlborough wine industry and one of a fairly small number of independent wineries in an increasingly multinational, corporate industry. The session was accompanied by wine tasting (five wines) and food matching with canapes. It is a situation where I rather regretted my unbreakable rule of never drinking when presenting to an audience. Sauvignon blanc, Chardonnay, Gewurtztraminer, Riesling and Pinot noir – but not a drop passed my lips until we had finished. One of the other aspects of our WOMAD that really impresses me is the zero waste priority. Unlike most events that attract thousands of people, WOMAD is simply remarkable for its total absence of rubbish on the ground and the use of compostable or reusable serving dishes and drinking vessels. It is proof that with a good set-up and plenty of good management, litter and plastic waste can be eliminated. It is a three day festival, but we piked after two days. We are not used to crowds and noise, and come Sunday, we were both happy to have a quiet day in the garden at home. Down in our park the crepe myrtle (lagerstroemia) is like blossom. It does not often bloom like this but this is an indication of the long, hot, summer we had this year. Usually we grow it for its attractive bark and the flowers are sparse and pass without attracting attention. The colchicums are also flowering – in the rockery but also naturalised down in the park area that we now call the meadow. That is surely a sign that autumn is here. This entry was posted in Abbie's column and tagged Abbie Jury, Bowl of Brooklands, colchicum autumnale, crepe myrtle, Tikorangi: The Jury garden, Womad New Plymouth on 19 March 2018 by Abbie Jury. When I am old and maybe decrepit, needing to draw in the boundaries of the garden, I shall fluff around in the rockery. I really enjoy this area and, as we enter autumn, my heart sings with the new season blooms. Traditionally, rockeries are for growing alpines and sometimes retaining banks. However, we can’t grow alpines in our climate and our rockery is on the flat. It is pure 1950s vintage, built from a combination of rocks of various sizes, concrete and some brick, with sunken paths and raised beds divided into many hundreds of little pockets of soil. It is designed for highly detailed gardening and at about 20 metres by 10 metres, it is relatively large. The purpose of the multitude of small beds is to keep bulbs separate and to confine the more invasive ones. Most of the pockets have two or three different types of bulbs in them to give seasonal interest. There is always something to see, though summer is the toughest season. Because there is so much stone and the beds are elevated, parts of it dry out almost to dust. We have dwarf conifers, cycads, and a few other small shrubs to give both all year round structure and summer shade. There are a few smaller perennials and a limited range of annuals and biennials but generally, the rockery is about the bulb collection. As we enter autumn, it is as if the rockery heaves a sigh of relief and leaps back into life. All the bulbs whose growth is triggered by autumn rains start to move. As a general rule, we find that the species bulbs look better. They are usually smaller flowered and more delicate in appearance than the showy hybrids which can look out of scale and even vulgar in this particular context. The exception is the nerines which peak this month. While we grow some nerine species, it is the sarniensis hybrids that dominate. A few of these are of Exbury origin but most are the result of breeding efforts by both Felix and Mark Jury. The colour range is delightful – from white, through every shade of pink including near iridescent highlighter pink, to purple, corals, almost apricot, oranges and reds. Unlike the floristry business, we want shorter, squatter stems so that the heavy heads are held upright even through autumnal weather. Also lighting up the autumn is Cyclamen hederafolium (formerly known as C. neapolitanum) which hails from southern Europe and Turkey. This is the easiest of the dainty species cyclamen to grow and it has gently naturalised itself here. It throws its first brave flowers up in January but peaks this month. It is one of a number of autumn bulbs that bloom first before the leaves appear. Others are most of the nerines, colchicums and Haemanthus coccineus. The pretty autumn flowering peacock iris, Moraea polystachya, outdoes almost every other bulb with its long flowering season. It seeds down gently into the cracks between the rocks without becoming an invasive menace. Some of the ornamental oxalis also give extended displays of colour but not all oxalis are born equal and neither are they all born with good manners. The most reliable performers in our rockery are O. purpurea ‘Alba’, O. luteola and O. lobata. They have been here for decades and never looked threatening. Then there are the bulbs with a much shorter season. Colchicum autumnale makes a bold statement with its big lilac chalices held above bare soil. Hippeastrum bifida is a transient delight for us. We have it in both pink and red and the blooms look as if they have been touched with gold leaf when the sun shines through. The autumn flowering leucojum is one of the daintiest and prettiest of tiny blooms and the crocus also delight. The rockery is not what I would call low maintenance. The more time I put into it, the better it looks. In spring I completely replaced the soil in maybe a dozen pockets in my efforts to eradicate the pretty but invasive Geissorhiza aspera. I do not lie when I tell you that we have battling it for well over 25 years, hence my extreme action in replacing the soil in the worst affected areas. We have to be vigilant on weeds, slugs, snails, narcissi fly and weevils. I wire brush the rocks from time to time to stop the moss growth from hiding their shapes. There is plenty there to keep me busy in my dotage and, with the raised beds, I can do a lot of it sitting on a stool. Sometimes it is the detail and the little pictures in the garden that delight. First published in the NZ Gardener April edition and reprinted here with their permission. This entry was posted in Abbie's column and tagged Abbie Jury, autumn bulbs, autumn crocus, colchicum autumnale, Cyclamen hederafolium, Moraea polystachya, nerine sarniensis, Oxalis luteola, rockery gardening, Taranaki gardens, Tikorangi: The Jury garden on 12 April 2016 by Abbie Jury. July may be the bleakest month of winter for us but it is also snowdrop time and these little charmers brighten the greyest of days. You can never have too many snowdrops in my opinion, and the varieties that do well with us are building up to a satisfying level. By definition, that is when we have enough to move them out of optimal garden or nursery conditions and start establishing them in carpets. It is our interest in what we call “romantic gardening” – others refer to it as “naturalistic gardening” – that we derive as much, if not more pleasure from plants naturalised in meadow conditions as we do from cultivated, tightly maintained garden beds. It is a blurring of the edges in gardening, exploring how far we can replicate the simple charm of wildflowers but in a managed situation. It is not as easy as it sounds. Many of the charming bulbs in their natural environment have conditions which are much harsher than here. Winters that are very cold and often dry mean that most growth stops, as do summers that are hot and dry. But in our dairy-farming heartland, soft conditions keep grass growing all year round and that growth will simply swamp most bulbs. It has taken us some years to learn to manage this. Selecting bulbs that will cope in our conditions has been trial and error. It also takes eleventy thousand more bulbs than you think it will. Even bulk buying a couple of hundred bulbs is not going to create much of a carpet in the short term. To get a quick result using large bulbs like daffodils or bluebells, planting at one every 10 square centimetres means 100 per square metre. I worked this out because I was planting a little mixed area. Using dainties like erythroniums, dwarf daffodils, snowdrops, crocus and rhodohypoxis, it took about 4 of these small bulbs per 10 square centimetres – or 400 per square metre. That is a large number and may explain why we don’t see many bulb meadows in this country, beyond well established fields of daffodils dating back many decades. Obviously, if you plant at greater spacings, you can cover a larger area but you will wait longer for the carpet effect. While planting around tree trunks is not the same thing as naturalising bulbs in a meadow situation, it proved to be a good place to start for us. We have many trees in fairly open situations where it is possible to establish easy bulbs beneath. Most bulbs need sun so these need to be trees with a higher canopy to allow light below. Planting amongst the exposed roots of established trees ensures the bulbs don’t get mown off or trampled as they surface and generally they get established with little competition. It is also an effective way of controlling some of the invasive bulbs like ipheions and ornamental oxalis. Scattering seed is hit and miss and slower to give any results but much easier. We were delighted this year to see Cyclamen hederafolium showing its colours where Mark had scattered fresh seed several years ago. He had given up hope that it would work but lo, there are rewards for patient gardeners and the older we get, the more patience we seem to be developing. Bluebells are easy and we have used them in swathes around shrubs in the area we call our park. Because they are flowering at the same time as the full flush of spring grass growth, we have to keep them to the side of areas we need to mow. Bluebell, and indeed snowdrop, woods that we have admired in Britain are carpets beneath deciduous trees. Our woodland areas are heavily dominated by evergreens so we don’t get enough light to replicate those carpets here. That is why we have to opt for the margins instead. The triumph of experience has been getting grassy banks with dwarf narcissi and snowdrops naturalised. To do this, Mark spent some years establishing the native grass, microlina. It is finer and less vigorous so doesn’t swamp the bulbs and can be controlled with minimal cutting – just a pass over with the weedeater from time to time. It is not quite the same as a bulb meadow, but we have learned to work with what we have here. First published in the July issue of New Zealand Gardener and reprinted here with their permission. This entry was posted in Abbie's column and tagged Abbie Jury, bluebells, bulb meadows, colchicum autumnale, galanthus, Lachenalia aloides, naturalising bulbs, snowdrops, Tikorangi: The Jury garden on 17 July 2015 by Abbie Jury. The demise of two of our grand old pine trees a few weeks ago has necessitated a fairly large clean up. They were about 140 years old and had been on a major lean for much of that time. Clearly they passed the point of balance. But, as happens in gardens, their collapse also opened up an opportunity. Suddenly there was a nice little area which had been dense shade and more or less left to its own devices but was now light, open and clearly of potential. “Bulbs,” I thought, “I shall plant it in a succession of bulbs to take it through the seasons.” I started with what was already there – a congested but large clump of snowdrops, a few cyclamen and some valiant pleione orchids which were battling on despite choking ground cover plants. Then I raided the nursery where we still had quite a few pots and trays of suitable bulbs, particularly dwarf narcissi of various types. By this point, I was already committed to using minis and dwarf growers which would co-exist and not choke out their growing companions. So how many bulbs are needed to fill an area? As I continue to raid suitable bulbs from wherever I could find them, I started to do the maths. We are not talking a large area here. It is maybe 10 square metres (5x 2) at the most. Do you have any idea of how many dwarf and mini bulbs are needed to fill that space? Allowing maybe 5 bulbs per 10cm square, that adds up to a massive …. 5000! Okay, so the cyclamen are not planted at that density, but many of the others are. Had I chosen to start with larger bulbs of stronger growing varieties – full sized daffodils, bluebells, tulips, colchicums and the like – I could have planted them at maybe 10 cm spacings so would have only needed about 1000 bulbs. It is still a lot. The lesson is that if you are besotted by bulbs, as we are, it helps to learn how to look after them so that you can increase the supply for other plantings. Having depleted the nursery of spare bulbs that are suitable for this situation, I am now taking apart beds in the rockery to thin the bulbs there and get the surplus for my new area. So far, as well as the types already mentioned, I have added rhodohypoxis, blue brodiaeas, various different lachenalias and crocus. I am aiming for mix and match in the hope that there will be something seasonal and dainty flowering in that particular section at all times of the year. It will take some tweaking over time to get it right. I have a mix and match of large and some invasive bulbs beneath a huge old gum tree at our entrance. Invasive bulbs are easily contained there and there is room for sometimes scruffy performers like the belladonnas to put on a good show. Elsewhere, we have tended to keep our bulb plantings separated by variety. This may be our nursery background – keeping the option open to start selling bulbs again if need be. But a big show of a single variety can be striking. We sometimes use the root zone at the base of large, specimen trees, usually on the sunny side because most bulbs enjoy light but are adapted to surviving quite harsh conditions. This gets them out of the way of the lawnmower. But really what we covet most are drifts of bulbs – informal, randomly organised rivers of seasonal colour flowing through. In harsher climates where the grass stops growing in winter (too cold) and summer (too dry), it is possible to do it in grass. But not here. Without significant management, the strong growing grasses overwhelm the bulbs and need mowing before the foliage has had a chance to carry out its function of replenishing the bulb. It is easier to work with bulbs which shed their foliage quickly. There are big differences in how long different types keep their leaves – anything from 4 to 6 weeks up to 11 months. Fortunately the pretty snowdrops (galanthus) are light on foliage, because what we really want over the next decade is to develop proper drifts of snowdrops. Not a few hundred. Thousands. They will be a fleeting wonder lasting a mere week or two each year. But it is the sheer frivolity of self indulgence that will spur on the snowdrop dream. At least we know which ones perform well in our climate – without snow or much winter chill – and we will just gently work on it by continually dividing and spreading the existing clumps. I am guessing the one clump of Galanthus viridapicis in my new little bulb garden yielded upwards of 300 bulbs. That is a good return. This entry was posted in Abbie's column and tagged belladonnas, bulb meadows, colchicum autumnale, Lachenalia aloides, planting density for bulbs on 6 December 2013 by Abbie Jury. Autumn. It is indubitably autumn. I can no longer pretend it is just the summer slowly waning and that winter is still a long way off. For most people, autumn is synonymous with leaves colouring to fiery hues. However those of us in coastal areas may carry that mental image but the reality can fall well short. Inland areas get much better autumn colour because the nights cool down more rapidly and it is the sharp drop in temperatures which triggers the colouring response in most deciduous plants as much as the declining day length. The moderating effect of the sea means we drift far more slowly between seasons and the leaves are inclined to turn brown and fall, skipping much of the colouring process. Our extensive use of evergreen plants in this country also mitigates against fantastic mass displays of autumn colour. Our native plants are all evergreen and in a generally benign gardening climate, we tend to favour evergreen exotics as well. I have met many gardeners who shun deciduous plants because they are allegedly messy and lack winter interest, which has always seemed a bit myopic to me. We are never going to rival countries like Canada with its native maples when it comes to a mass blaze of autumn tones. It is the autumn bulbs that signal the change in season for me. There are so many pretty seasonal flowers coming through now. These are triggered into bloom by a drop in temperature, declining day length and some by late summer rain – don’t laugh at that last one. Gardeners in this country tend to focus on the spring bulbs – from the early snowdrops through the snowflakes, bluebells, tulips, daffodils, anemones and ranunculus. These are readily available and marketed widely. They also flower at a time when the majority of trees and shrubs are blossoming forth. The autumn bulbs have never captured the market in the same manner yet they bring freshness to the garden at a time when many plants are looking tired or passing over. I find them a wonderful antidote to the autumnal despondency of declining day length. There they are, all pretty and perky, just coming into their prime. I often feature selected autumn bulbs in Plant Collector because this is their time to shine. As I wander around the garden, I see carpets of Cyclamen hederafolium (flowers only so far – the leaves have yet to appear) and taller spires of the autumn peacock iris, Moraea polystachya, which is inclined to seed itself around a little. This lovely lilac moraea has one of the longest flowering seasons of any bulb I know. The common old belladonnas are already passing over but I enjoy their blowsy display while it lasts. We use them in less tamed areas on the road verge. Over the years, I have waged a campaign to convince people of the merits of the ornamental oxalis, many of which are autumn stars. Call them by their common overseas name of wood sorrel, if the mere mention of oxalis makes you shudder. The range of different species is huge. By no means are all of them nasty weeds and many are not the slightest bit invasive. We have them flowering in white, yellow, apricot bicolour, a whole range of pinks, lilac, lavender and even crimson. Some are perfectly garden-safe. I can vouch for their good behaviour after decades in the garden here. Others I keep in pots – preferably wide, shallow pots for best display. And nerines are the major feature of our autumn rockery. The majority of these are sarniensis hybrids with big heads of flowers. By no means are all of them the common red of Nerine fothergillii or the strong growing pink Nerine bowdenii which comes later in the season. We have some lovely smoky tones, reds deepening to violet hues, a remarkable lolly pink – the colour of a highlighter felt pen, two tone sugar candy and even heading to apricot. Nerines are renowned as a good cut flower but I never cut them. There is only one stem per bulb and I would rather admire them in the garden than indoors. Then there are the bold colchicums which, contrary to popular belief, are not autumn crocus but certainly put on a splendid show with a succession of flowers from each corm. You have to go a long way back in the botanical family tree to get any relationship between colchicums and the proper autumn crocus. The latter is a much more delicate and transient performer whose flowers appear at the same time as its foliage. Currently, we are enjoying both in bloom. Some bulbs are quite transient in flower but no less delightful for all that. If I am ever forced by declining health and aged frailty to trade down from a large garden, I can see that it would bulbs that I would chose to grow. I love the way they mark the seasons and how there can always be a different one coming into its time to star. 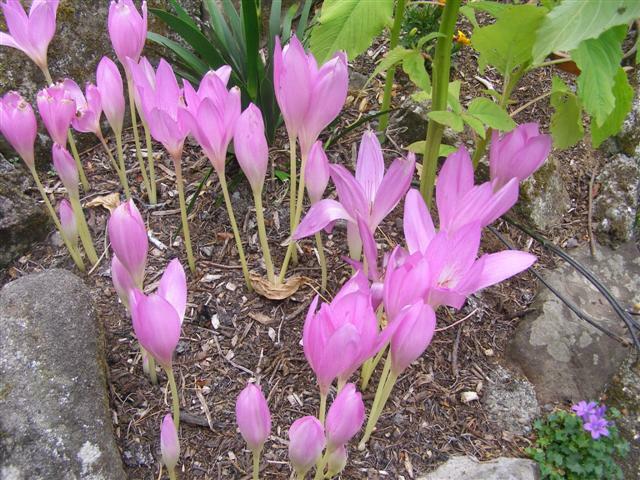 This entry was posted in Abbie's column and tagged Abbie Jury, autumn bulbs, colchicum autumnale, Cyclamen hederifolium, gardening, Moraea polystachya, nerine sarniensis on 5 April 2013 by Abbie Jury. Of naked ladies, autumn crocus and so-called autumn crocus. Just for the record, and in light of finding myself in print with some incorrect information which I didn’t actually write, I offer the following clarification. The true autumn flowering crocus is in fact a crocus. There are many different species in the genus of crocus, some flowering in spring and some in autumn. Generally, crocus flower around the same time their foliage appears. We don’t have a species name on this pretty autumn crocus in our garden. Trace the botany of crocus back and they are part of the subfamily of Crocoideae, the family of Iridaceae and the order of Asparagales. Colchicum autumnale flower about the same time for us, but the flowers appear a long time before the foliage so they are sometimes called naked ladies. Equally, they are sometimes referred to as autumn crocus but they are not. Again it is a big genus with many different species but they come from the family of Colchicaceae and the order of Liliales. Sternbergia are sometimes referred to as autumn crocus but they are no more autumn crocus than colchicums. In fact they are more closely related to narcissi than crocus (a fact I discovered from the Pacific Bulb Society) and they are closely related to amaryllis. However, they flower with their foliage and their blooms, generally yellow, resemble a crocus in form. We have sternbergia in the garden here but they don’t flower overly well for us, possibly because they are essentially a Mediterranean plant which likes a hot, dry summer. Also widely referred to as naked ladies are Amaryllis belladonna or the belladonna lilies that are mostly seen as roadside plants here. The genus is amaryllis, the species is belladonna (and there is only one other species in that genus) but the sub family (Amaryllidoideae) and then family (Amaryllidaceae) are the same as sternbergia. Trace them back another step on the Linnaeus chart and you find they are from the order of Asparagales which is where they meet the family tree of crocus – quite a long way back, botanically. The bottom line is that the true autumn crocus is indeed a crocus, though it may be one of many different species. This entry was posted in Abbie's column and tagged Amaryllis belladonna, autumn bulbs, autumn crocus, colchicum autumnale, naked lady flowers, sternbergia on 28 April 2012 by Abbie Jury. Now that the temperatures have dropped noticeably and I am reconciled to the thought that summer has been and gone for another year, I am prepared to welcome the sight of the colchicums in flower. These are often called the autumn crocus because their simple six petalled cup-like flowers resemble those bulbs but they are distant relatives at best. They have their very own botanical family which is colchicaceae. Their flowers are considerably larger than most crocus and they flower well before their foliage appears. Because they have very large bulbs and grow quite vigorously, they are not shy delicate little things you will lose in a garden situation. In fact they can be naturalised in grass. The flowers are more lilac than pink and are hardly long lived but you can get a succession of them from a single bulb. When the leaves appear, they are relatively large, lush and green but the downside is that the foliage hangs on for a long time into early summer by which point it no longer looks attractive at all. Autumnale is native to quite large areas of Europe. Colchicums are the source of colchicine, a controlled pharmaceutical of considerably potency used in cancer treatments and also to cause mutations in living cells, which is sometimes advantageous but does need to be handled with care. These bulbs are also the true Naked Ladies though we more commonly refer to belladonnas as bearing this politically incorrect epithet. This entry was posted in Plant collector and tagged Abbie Jury, autumn bulbs, autumn crocus, colchicum autumnale on 26 March 2010 by Abbie Jury.